Office plants. Because seeing green is good for you. Recent studies on cognitive function have consistently indicated that indoor environments which include green views and plants help people think better. Attention, creativity, emotional resilience and problem solving are a few areas that benefit. Though the biggest benefits come from spending time outdoors in nature, you can still make this finding work to your advantage by adding plants to your office. So which plants should you choose? Here is a list we recently put together for a client seeking easy-care options. Pothos adapts well to a variety of office conditions, from low light levels to brighter ones. 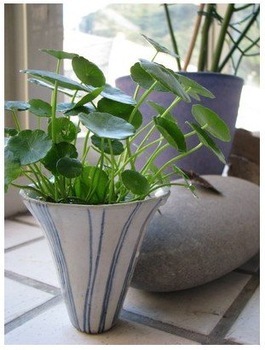 This easy-care plant, with heart-shaped, white-splotched leaves, makes a lovely addition sitting on a desk, shelf, or table. Philodendrons, of which most are climbers, are great for adding height to small areas. Sit them on filing cabinets or in hanging baskets. These plants are easy to grow and suitable for a wide range of indoor conditions, including occasional neglect. Spider plant is not only one of the cool office plants with its small spiderettes hanging down, but it’s also one of the easiest plants to grow indoors. Stick it up high for all to admire. Snake plant, or mother-in-law’s tongue, makes a huge statement in the office. It has attractive sword-like leaves that grow somewhat tall, making it excellent for focal interest or screening. When all else fails, there’s the trusty cactus (or jade, or other succulents). Just be sure to keep it located where no one is likely to be stuck. There are many types to choose from, all of which are certain to spark conversation. Rubber plants not only make an excellent addition to nearly any office decor, but they are well known for effectively removing indoor air pollutants. Dracaena, or corn plant, is another great choice for eliminating pollutants. It’s easy to care for and makes a unique focal point or screening plant. Peace lily is also known for cleaning up the air. It’s tolerant of low light and is a vigorous grower too. Peace lily works well for focal interest and screening. English ivy is not only easy to grow but also helps eliminate mold. Thriving in nearly any light condition, it looks great climbing up a pole or in a hanging basket. The umbrella plant (tree) is perfect for providing privacy, as it grows quite tall. The amount of light generally dictates this one’s care – low light, drier soil; bright light, more water. Boston ferns can provide a nice touch to the office as long as their basic needs are met. They require adequate lighting and moist soil. No space? Consider the African violet. It is one of the best office plants you can find. While these cute little plants require a little more upkeep, such as plenty of light and moisture, they’re great for adding a splash of color to dreary office environments.